Home » Animals » Flying saucers, people living in a giant golf ball, praying to the God of Golf, and giant animal statues. Also? Beware of donkeys. ← Birthplace of Route 66, the Mother Road. And I saw Pandora’s Box in the men’s room. The infamous Area 51 is in Arizona, a state where many people claim to have seen UFOs. I’ve met some of them. The people, not the UFOs. One told me there is a local support group for alien abductees. To capitalize on the alien folklore by simultaneously combining themes from Area 51 and nearby Route 66, some enterprising folks came up with Area 66. It’s in a town called Yucca. Yes, it is. A "UFO" at Area 66. It's just landing, and in a minute the green VW Bug will be flattened. The woman running the small convenience store at Area 66 has seen UFO-type lights. She seems completely sane. Probably because she considers they were most likely aircraft from the nearby military facility. However, the guy who insisted on building the above flying saucer for Area 66 claims to have been abducted by aliens. 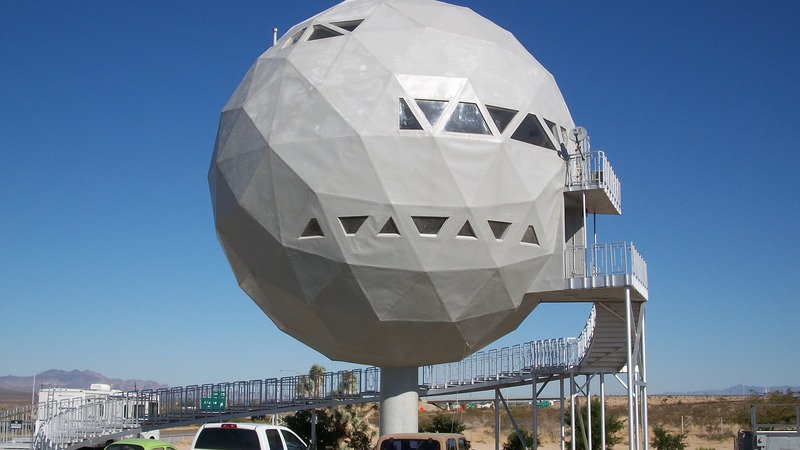 There is an apparent love for GIANT golf balls in Arizona. So much so, someone built a huge Gold Ball House. It was part of a development deal that never went through. The Golf Ball House at Area 66. Occupied by people. At least, I think they're people. Yes, people live in it. 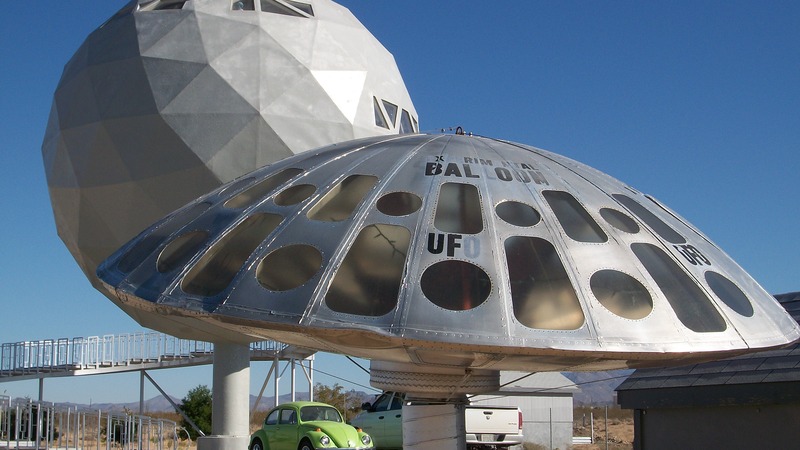 The current owners of Area 66 do now, but plan to turn their spherical home into an alien and UFO museum. You may be thinking, “So, what’s one giant golf ball?” Sure, that’s not so odd, but how about three together? As a church? 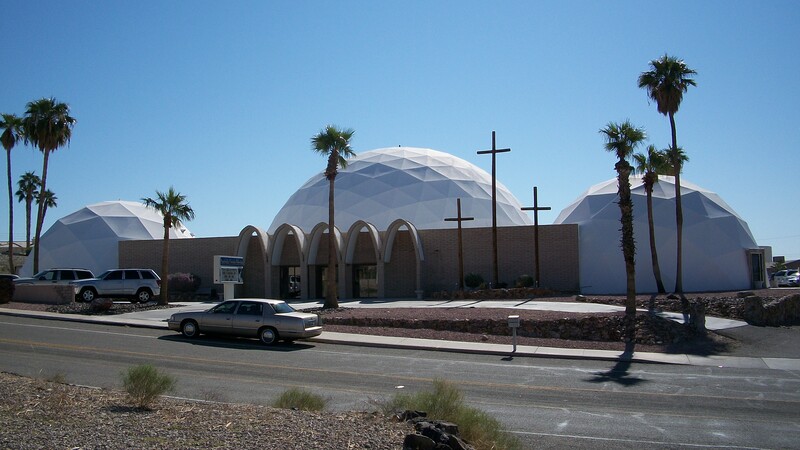 A golf ball church for praying to the God of Golf. Of course. If you’ve ever played golf, then a church for the God of Golf makes perfect sense. There were several large animal statues around Arizona, so I made a little slide show for you. 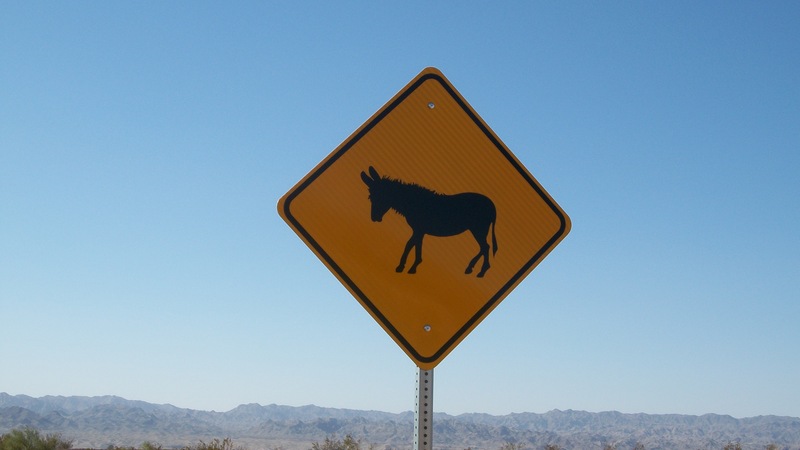 And for a final bit of randomness… Beware: Donkey Crossing. Yup, I said ‘donkey crossing’. There are wild donkeys in Arizona. Beware, weary travelers, beware. I did not make this up, this is a real sign in Lake Havasu. A sign that donkeys are coming. The Bloggess needs a sign like this. But unlike the Rastafarian Donkey in her Texas neighborhood, this one in Lake Havasu has obviously been to the barber. Next I find out if the London Bridge really is falling down, and discover many lighthouses in a state that has no fog. LOL! Bluz, you’re lines are better than mine! Are you still driving randomly around my state? Making it closer to Phoenix yet? No, I’m in the California desert. Been here about two weeks. Very limited internet and cellular (thanks for nothing, Verizon). Sedona was the closest I got. I’m sorry we didn’t get a chance to meet up! Alien abductees. I used When I taught abnormal psychology, I used alien abductees as an example of schizotypal personality disorder. secret agent woman’s last post ..Who Would Jesus Bully? Now, *that* makes sense. Although, I’m still hoping to see a UFO/top-secret military something fly overhead. Does that make me crazy? Well, I guess that’s not exactly a secret. Oh man…you god of golf just turned my boyfriend to religion! I wish you could have found that abduction hot-line…I can just imagine that conversation! Your boyfriend would like Arizona. There are supposedly alien abduction meetings – support groups of fellow abductees. I kind of wanted to go to one just to hear the stories. Many claim that the Bible is “the best UFO book ever written” and that the prophet Ezekiel saw a wheel-shaped flying saucer. Some even suggest that the “sons of God” in Genesis 6 depicts advanced extraterrestrials visiting the earth and mating with humans. Many Claim that the Bible is “the best Dinosaur book ever written” and that Job speaks of a creature which swings it tail like a cedar and the Book of Deuteronomy speaks of a land of Giants.